Welcome to my "Island Dream Life". ALOHA ! My name is Lisabongzee and I live in Hawaii. I love to paint. Most of my paintings have to do with the easy laid back island life style. 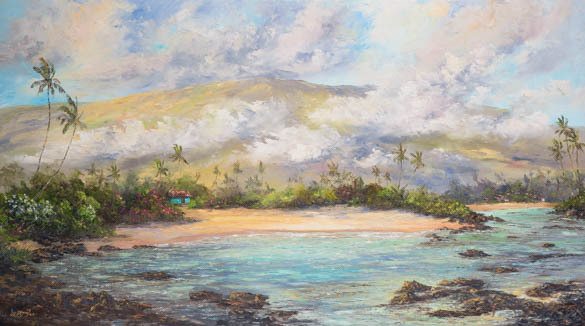 Tiki huts, surf scenes, palm trees, beautiful island lagoons, old style plantation houses, ocean waves, rugged sea cliffs, and tropical flowers and plants are all some of my favorite subjects. Hawaiian, Tahitian, Marquesan, Samoan, and South Pacific themes are what I love. I enjoy exploring the islands, finding new inspiration. In fact, since I started painting, I have learned to appreciate this islands beauty even more. Noticing the brilliant green shades of the lush mountains during the rainy season, and the dazzling transparent aqua ocean on a calm day. I never take these things for granted, I am truly lucky to be able to live in such a beautiful place. Most of my paintings are landscapes. I use oil paints and a palette knife. Thank you for taking the time to check out my website and my artwork. Please bookmark my site, and check back often. I am adding new paintings all the time ! MAHALO & ALOHA from Hawaii !